The demand for plaza deck waterproofing has grown drastically in recent years, and for a good reason. A plaza deck is installed over an occupied space or in areas where water infiltration is intolerable. This makes it important to have an adequate waterproofing system installed and functioning properly. Depending on the deck’s surface, you might want to consider different plaza deck waterproofing options. This post enlightens you on various choices available for creating a waterproof deck. This is one of the most effective options. It comprises of synthetic rubber polymers, 100% blend of asphalts, and fillers. Its formulation gives maximum toughness. Most experts prefer it because of its low vapor permeance and low absorption. It bridges cracks and restricts any lateral water movement. This is a waterproofing coating which creates a seamless finish soon after it’s applied. The coating is resistant to water, making it a perfect long term shield any future water leaks. It forms a seamless membrane with ease, cures in just 24 hours, and doesn’t emit a solvent odor. 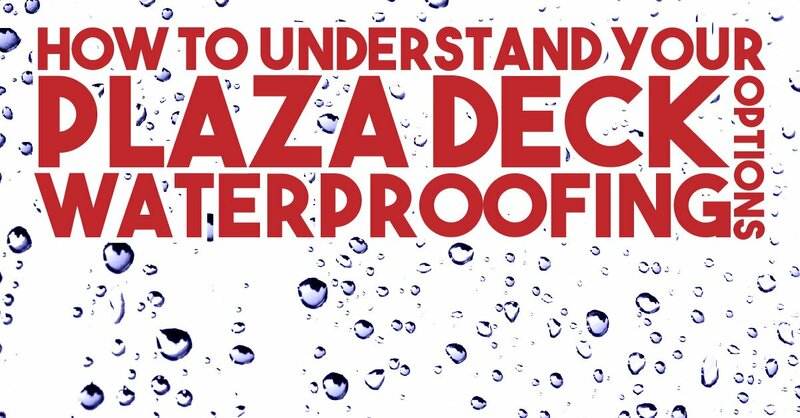 This option provides instant waterproofing capabilities to your plaza deck. It combines properties of coating and adhesives to provide a longer service life to your deck. It doesn’t shrink and comes with a low odor thanks to the low volatile organic compound used to make it. Reinforcing gives even better protection. It doesn’t slump as a result of high temperatures or develop cracks in extreme cold. Single ply roofing is a favorite roofing material for two reasons. It delivers excellent airtight construction as well as thermal insulation. It consists of a durable membrane which is resistant to rain, strong UV rays, and other weather elements. The membrane is also strong enough and has no inherent memory, meaning it will not shrink easily. This is a good alternative to hot rubberized asphalt. This high-performance bituminous membrane sticks well to your current deck. It is a viscous organic liquid created to provide the greatest waterproofing and protection against UV rays. It’s reinforced and bonds well with your current deck. A-1 Property Services offers reliable and professional waterproofing services for your plaza deck. Contact us and let us know what design you are looking to achieve. We’re happy to create a great waterproof deck for you.